Radosław Sikorski (lead image, left), the ex-foreign minister of Poland, ousted Speaker of the Polish Sejm (parliament), and premature retiree from the Bydgoszcz constituency, doesn’t speak his mind so much as his interest. 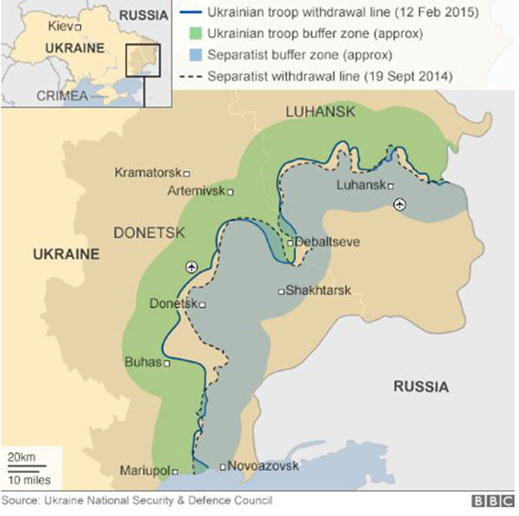 So why has he announced he is now in favour of leaving Crimea in Russia; a separate peace with the Kremlin for the Lugansk and Donetsk regions in eastern Ukraine, and a strategy for the government in Kiev to “concentrate on creating success for the 90 percent of the country’s territory which it controls”? Leading by example, Sikorski has acknowledged, can cost politicians their jobs. When Sikorski was in power, receiving state expense-account eats and drinks, he was privately hostile to those whom, in public, Sikorski appeared to be supporting. The record of the clandestine Warsaw restaurant tapes of Sikorski’s table talk reveal his eagerness to serve a local oligarch’s profit by banning imports of Russian coal. The tapes also exposed Sikorski’s expletive rancour against US President Barack Obama and British Prime Minister David Cameron for refusing to back his promotion to be NATO Secretary-General, then European Union foreign affairs commissioner. For the full story of Sikorski’s recriminations, read this and this. The tapes revealed a politician who changed his policy several times a day, depending on who was paying for lunch. An ongoing investigation by the audit and ethics committee of the Polish parliament is also examining the changeability of Sikorski’s income reports, along with those of his wife, Anne Applebaum. For details, read this. 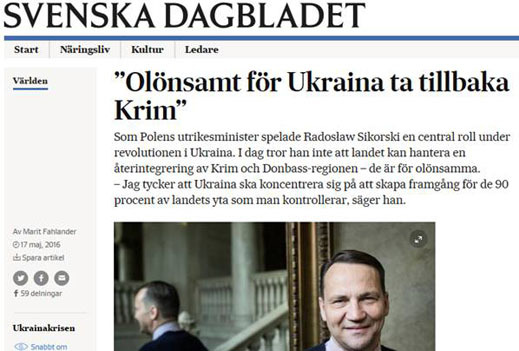 Nine months ago, in September 2015, Sikorski was pitching himself to President Poroshenko and then-Prime Minister Arseny Yatseniuk, as a new foreign minister for Ukraine. This too has proved a disappointment to Sikorski. Sikorski has been in Warsaw in recent days as Polish debate heated up on risks of war with Russia, conflict on the Kaliningrad frontier, and the reliability of the US and European alliances. A summit meeting of NATO will start in the city this Friday. Last week in Warsaw Sikorski met with former US Secretary of State Condoleezza Rice (lead picture, right) for a public discussion entitled “Saving the West: is Democracy under threat?” In August 2008, Rice (below, left) and Sikorski (right) had signed the US-Polish agreement to install Aegis, the US anti-missile interceptor system aimed at Russia’s nuclear missile sites. Following their rematch in Warsaw last week, CEPA facebooked its “privilege” and its “thanks”. The think-tank has yet to publish either excerpts or a transcript of what Rice and Sikorski said. Several Polish think-tanks and intelligence agencies in Warsaw have been tasked to find out why Sikorski has gone public with his change of policy on Ukraine. Confidential exchanges among them have reported three suspected reasons, according to Warsaw sources – two personal, one political. Because Sikorski’s future is uncertain, the Polish analysts warn, only time will tell whether reasons of heart or mind, sense or state, will prevail. The first reason is that Sikorski’s marriage with Applebaum is breaking up. She is a partisan of Hillary Clinton, and is hoping for a post in the new administration as the promoter of war with Russia on all fronts, including the recapture of Crimea and Donbass. “Vladimir Putin has a plan for destroying the West—and it looks a lot like Donald Trump”, tweeted Applebaum, and retweeted Sikorski, though neither of them said it. The second reason is that Sikorski’s marriage with Applebaum is stronger than ever, and they have agreed to a two-way hedge on the outcome of the US election in November. If Clinton wins, Applebaum takes the prize. If Trump wins, Sikorski gets the call to Washington. To appeal to Trump, Sikorski is offering to sacrifice Crimea and the Donbass. Rice has also issued an announcement through a spokesman that she is not running for Trump’s nomination to be vice-president. 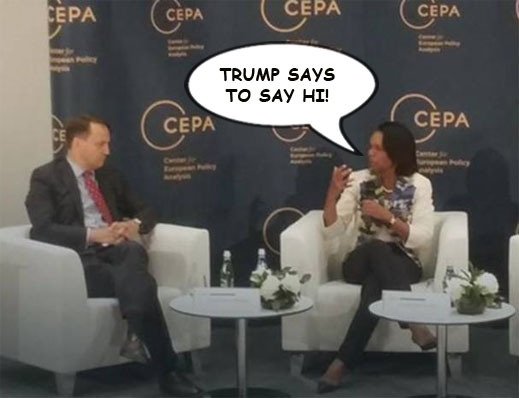 Rice and Sikorski reportedly agreed in Warsaw they aren’t ruling anything out come November – except 10 percent of Ukraine.